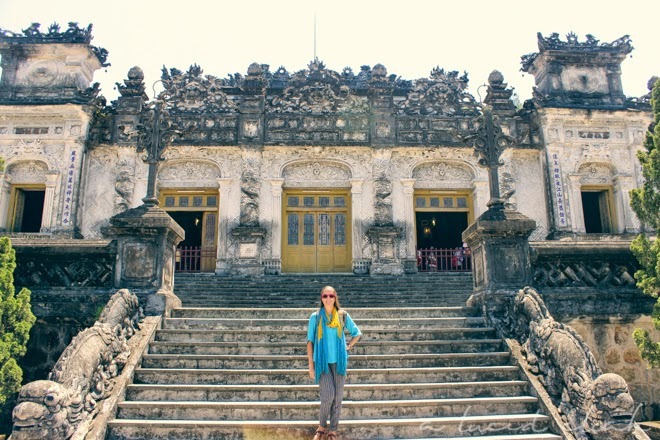 Getting to Hue was one of the most beautiful travelling experiences I’ve had. 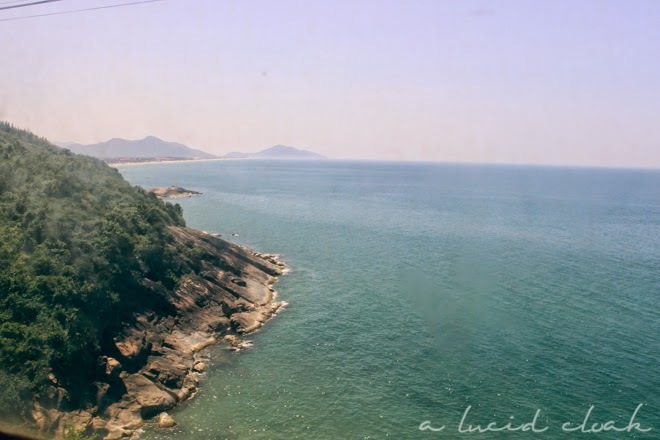 We took a taxi from Hoi An to Da Nang, where we hopped onto a 3-hour train to Hue. The journey was incredibly scenic and breath-taking. The train rattled along the ocean the entire time, disappearing into tunnels and snaking beside cliffs. I highly recommend taking the train instead of the bus. 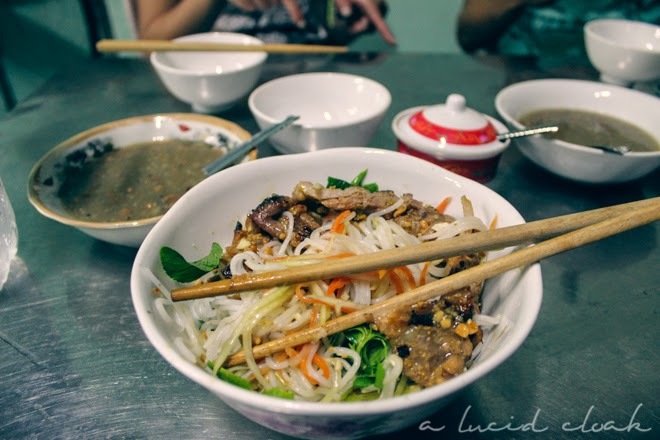 We decided on a home stay during our time in Hue. Simply known as Hue Amazing Homestay, it’s run by a husband and wife team (they also have an adorable little baby!). There’s an 8-person dorm upstairs divided into three rooms for a little privacy, which at $5 per night per person, is an exceptional deal. Staying with this family was one of the highlights of my entire trip. 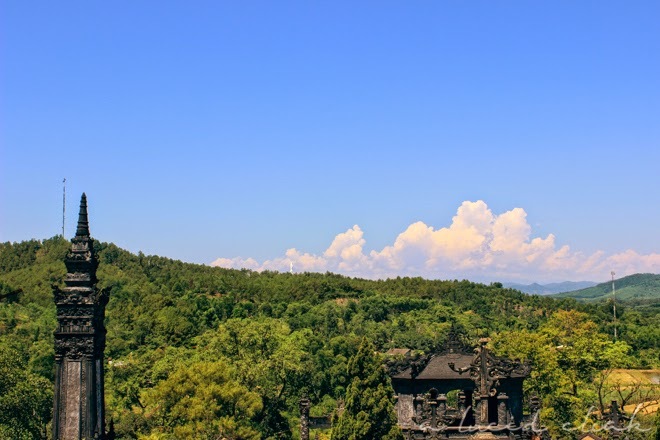 Hue is the city where Milos and I got into a motorbike accident while touring the tombs in the countryside. The husband and wife took exceptional care of me, bandaging me up, cleaning out my wounds, buying me sugary drinks so I didn’t pass out, letting me sleep on a bed during the day even though we had already checked out. 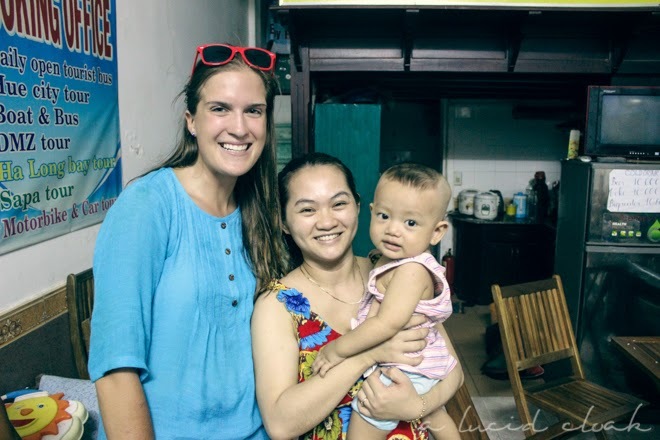 Their concern and care showed me just how hospitable the Vietnamese people can be. Plus, the free beer during happy hour every day was a major bonus. 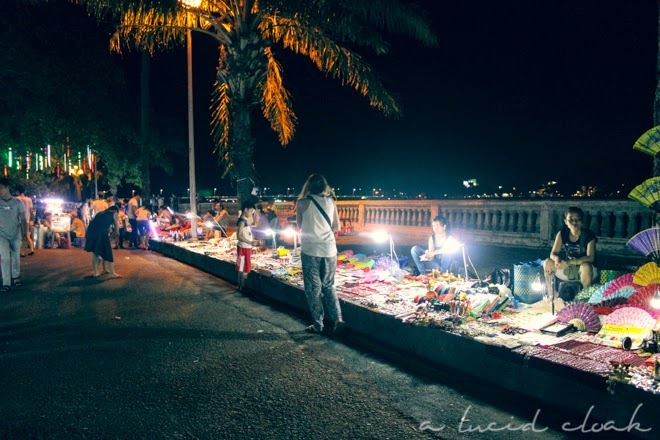 During the evening, we strolled down to the Perfume River and walked through the night market. There wasn’t anything different at this market than at the other ones, but it was still nice to get a feel for the city. 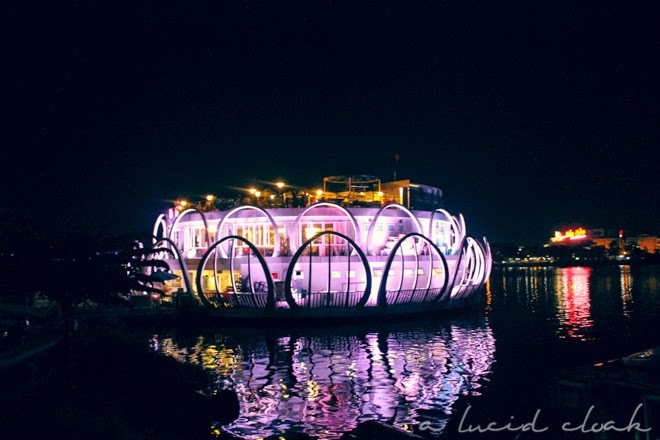 We did end up enjoying the Floating Lotus Restaurant, which is literally a restaurant that floats on the water. It looked super fancy and outside of our budget, but we just ordered some drinks at a very fair price and enjoyed looking out onto the city. We had big plans the next day to visit 3 of the Royal Tombs as well as the Citadel, but on route from a martial arts show to the 2nd tomb, Milos and I wiped out on our motorbikes. It was traumatic. My knee had a deep gash in it and there was a hole near Milos’s elbow. Gross. I took a taxi back to the homestay (refusing to get back on the bike, obviously) and slept the rest of the day away. Before the accident, biking through the countryside was beautiful — green rolling fields, groves of trees, interesting grave sites strewn along the side of the road. 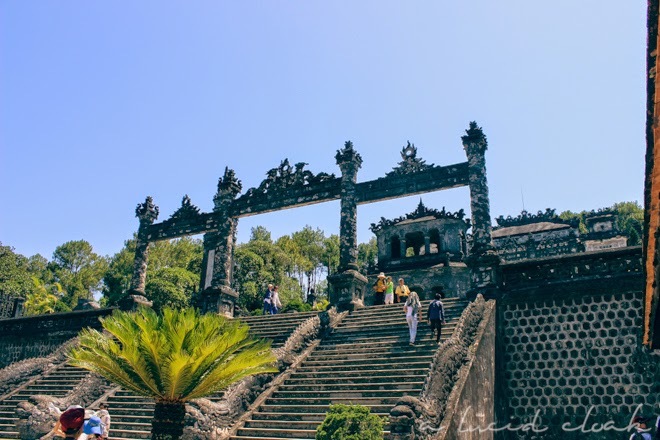 Khai Dinh Tomb had millions of steps leading up to the top, but the effort was well-rewarded with a stunning view. 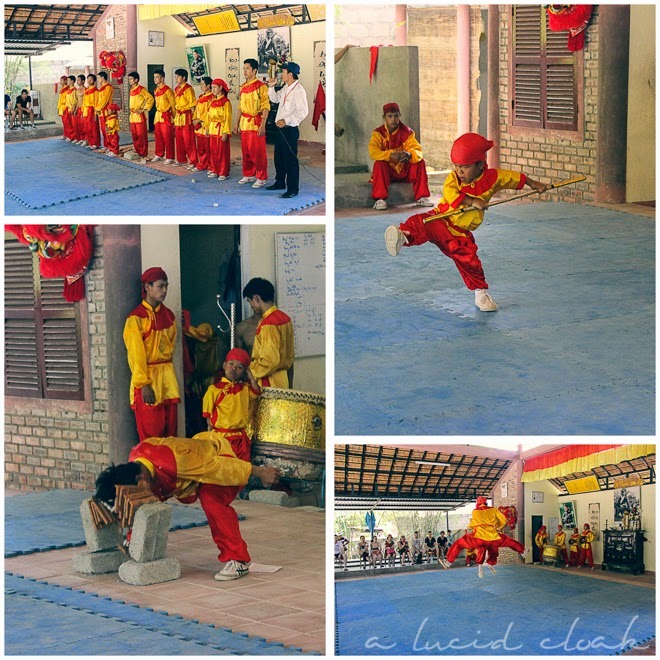 One of the coolest things we saw on the tour was a martial arts show. For only $5, we got to see some awesome fights and deathly moves (like breaking a pile of bricks with one’s head and resting one’s body weight on a spear that’s pointed at one’s neck).